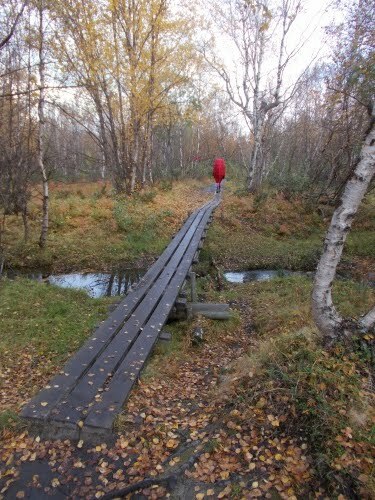 Although Karolina and I had finished the trail, we still had a couple of days before our flight out of the country. We didn't let dust settle on us, however. 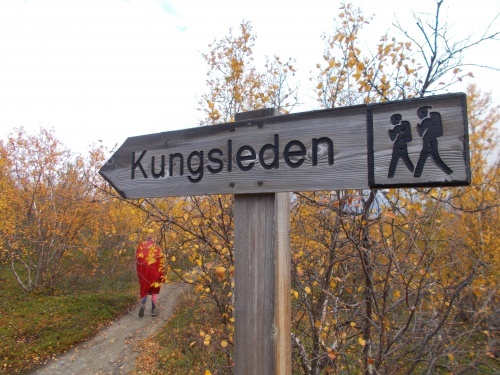 No, we kept hiking! We kept sightseeing! I'm feeling lazy about writing text, however, so I'm not going to write much text--mostly photos. 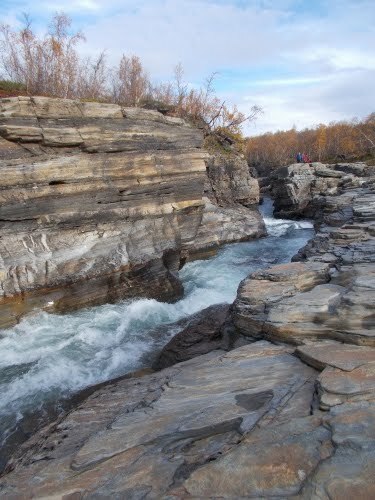 Our first full day after finishing the trail we went on a day hike in Abisko National Park which took most of the day. 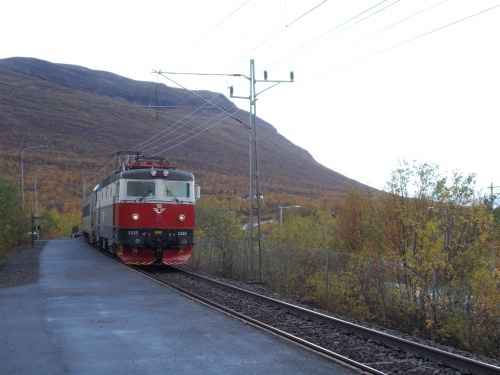 The next day, we took a train to Kiruna where we spent one more night before our flight was scheduled to leave Kiruna to Stockholm and into the rest of Europe. 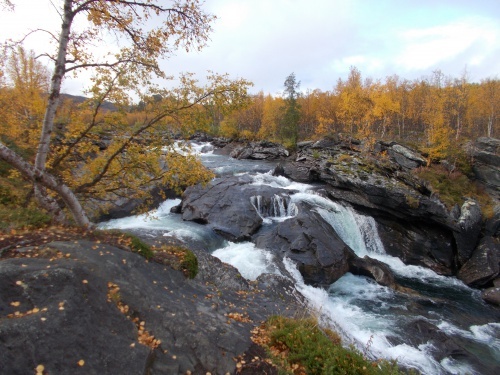 I will make a quick mention of Kiruna. Neither Karolina nor I knew much about the town before arriving--it was just the gateway to the airport for us--but it turned out to be a much more fascinating place than I had imagined. 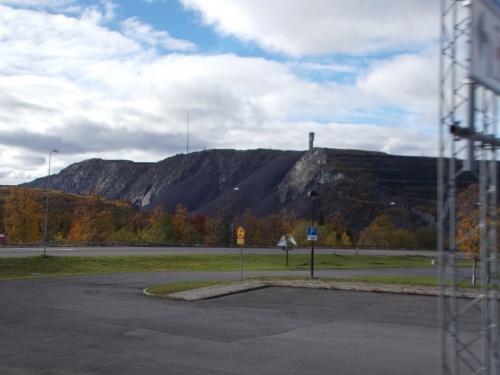 It's situated next to a giant mine--the largest underground iron ore mine in the world. 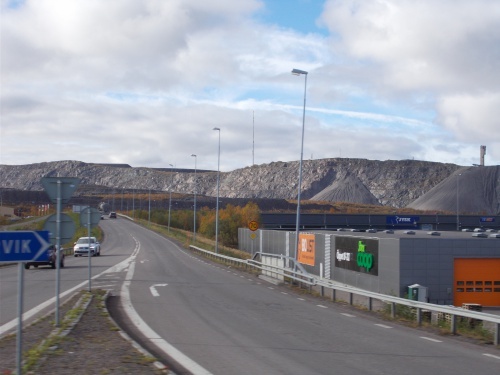 Magnetite is mined to produced various iron ores which are transported to Norway for shipment around the rest of the world. 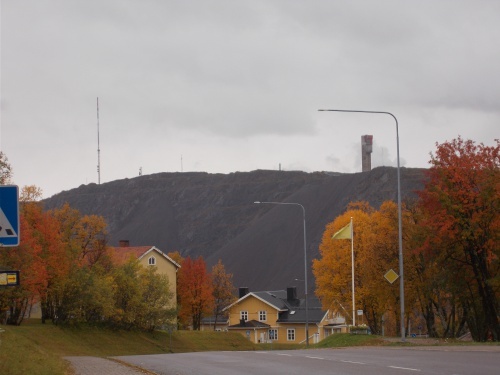 The tailings from the mine loomed over the city. 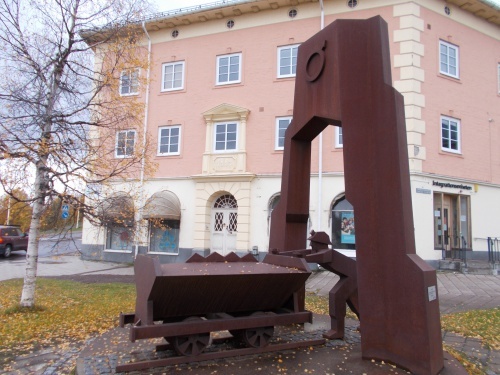 Because of the extensive mining activities, the city is slowly sinking and about ten years ago, they decided the city--or at least a pretty large chunk of it--needed to be relocated. 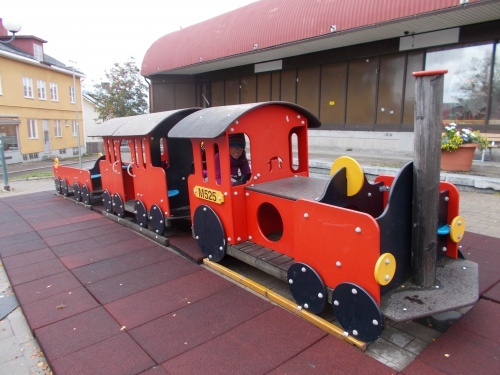 The downtown area is being move 3 kilometers away from its current location and an entire section of the city had been boarded off and was in the process of being demolished. 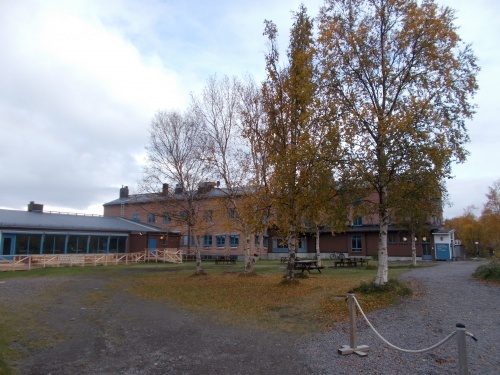 Buildings with historical interest will be moved. Needless to say, the relocation of a city with 18,000 people doesn't happen overnight. And--the mine is open for public tours! Which Karolina and I really wanted to do, but alas, we had arrived on a Sunday, the one day of the week when there are no tours, and we were scheduled to fly out Monday before the first tour would start. 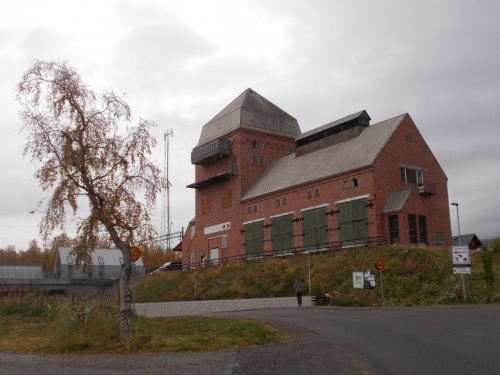 If I ever find myself stuck in Kiruna for a day again, I'm totally going to make sure it's a day when the mine is open for tours! So now to the after-trail photos! 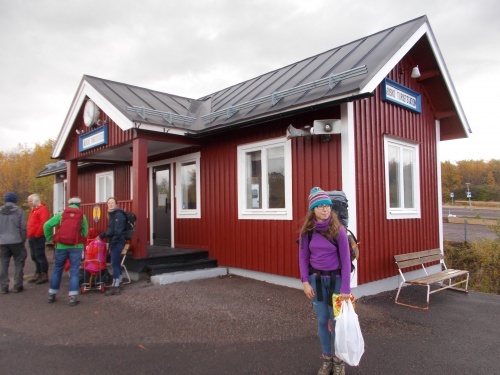 Karolina waits for the train to Kiruna. 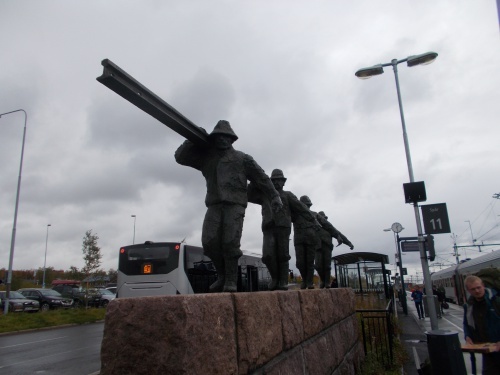 Kiruna has a lot of mining-related public art. It almost kind of looks like it's snowing in this photo, doesn't it? It's not, but all those fasteners on the train kind of looked like snowflakes in my photo, which is enhanced by the stickers on the building behind it and the leaves on the ground around it. Totally not snow, though! 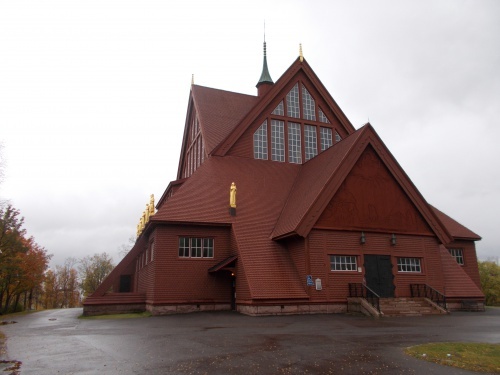 This very large wooden church will be relocated to the "new" town a few kilometers away in a couple of years. The massive mine looms over the city. 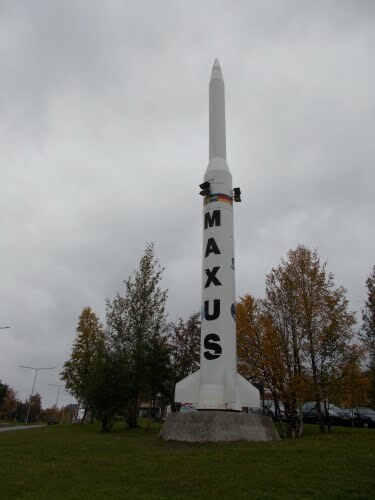 I have no idea why Kiruna has a rocket on display. 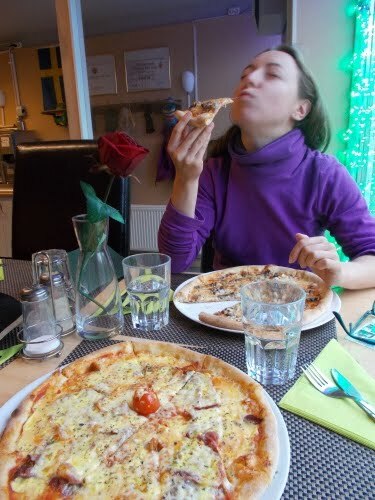 Karolina enjoys a pizza. You'd think she hadn't eaten one for a month! Because, you know, she hadn't. =) Also interesting, she ordered a reindeer pizza with real reindeer meat! The mine looming over the city again. We left the trail in the nick of time. 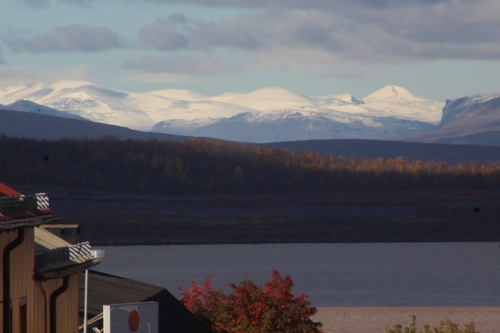 The snow in these mountains showed up only the night before we flew out! And I saw online that some of the huts we went by had been expected to get a few inches of snow. 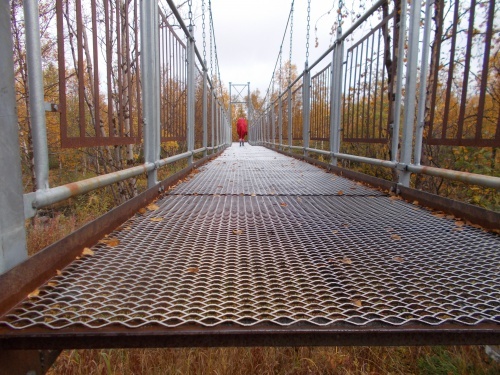 If we took just two days longer to finish, this is what we might have had to walk through! 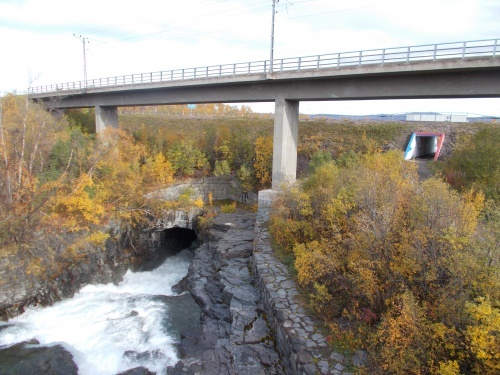 I took this video on the shuttle bus from Kiruna to the airport. Two things to notice--the large mine looming over the city, and the block or two that's being demolished and moved 3 kilometers away to the new city center. 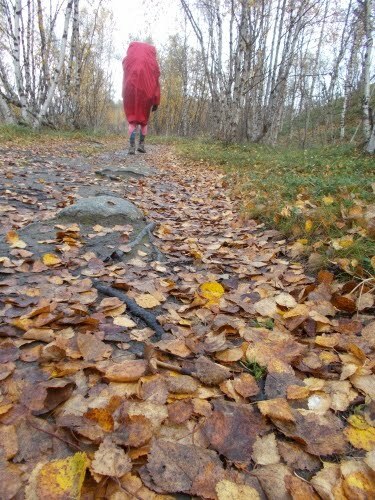 September 14: Once again, Karolina has taken over my blog wanting to be the one to write about our last day on the trail. So here is her take on our grand finale! 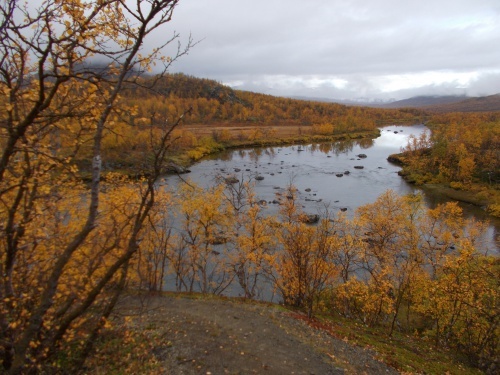 As it was our last morning on the trail we decided to have a feast and eat all breakfast portions we had left in our food bags—that should give us an extra energy boost on that dreary morning and we would have less to carry along the last stretch of the Kungsleden. Each of us ended up with a double portion of cereals topped up with a handful of blueberries that I had collected the evening before. We hit the trail around 8:00. 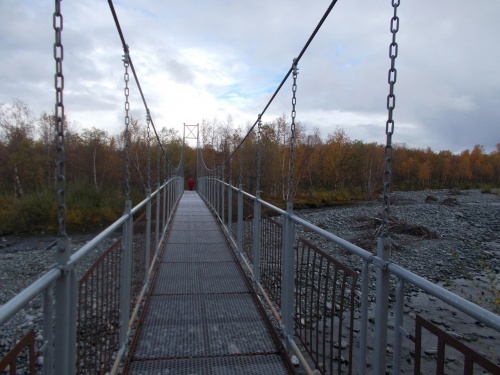 We went down into the valley, crossed a suspension bridge and much to our surprise found ourselves in a small town of tents! We had little idea how many people were camped so close to us! 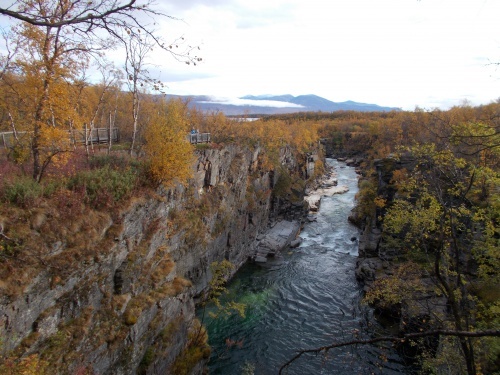 It made sense, though—we were right outside the boundaries of the Abisko National Park where wild camping is prohibited. 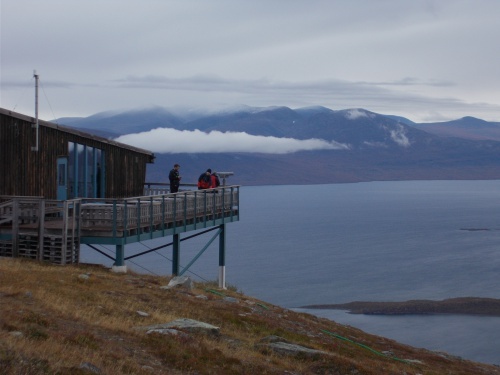 Hikers heading to or leaving Abisko have three options to spend a night: designated campsite 6 km from town, staying at the Abiskojaure hut 11 km from town or hiking 18 km to the national park boundary and wild camping right outside of it. 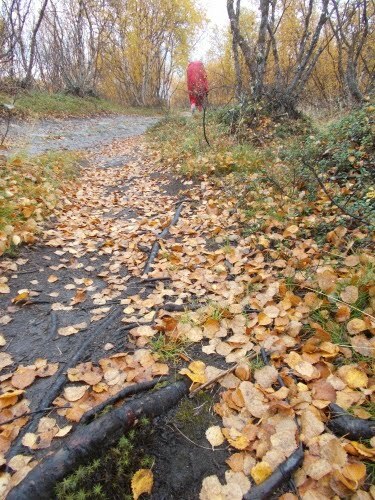 The third option seemed to be particularly popular with hikers—we could tell not only by the sheer amount of tents pitched in the area right now but also by dozens of clearly visible empty campsites created over the years where vegetation had been stampeded by thousands of visitors. During the high season, this place must be bursting in seams! 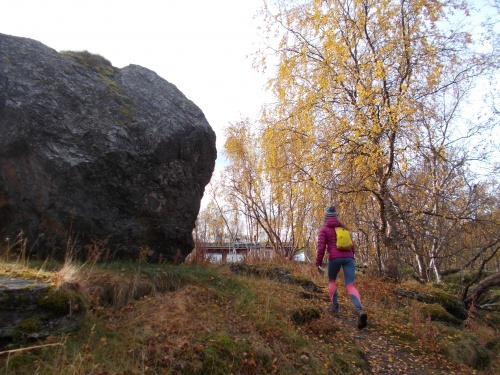 We took a short break at the Abiskojaure hut to visit privies. 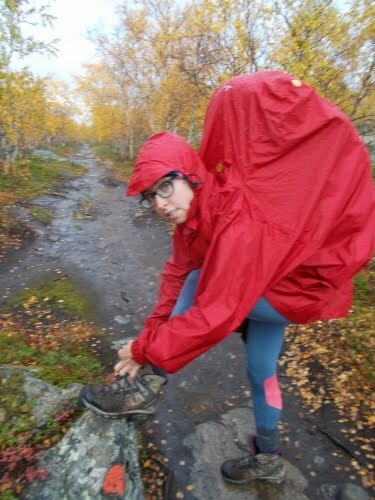 By the time we were ready to resume hiking, the rain started and we needed to gear up against it. I put on my cape while Ryan used his poncho to cover his pack and pulled out an umbrella. 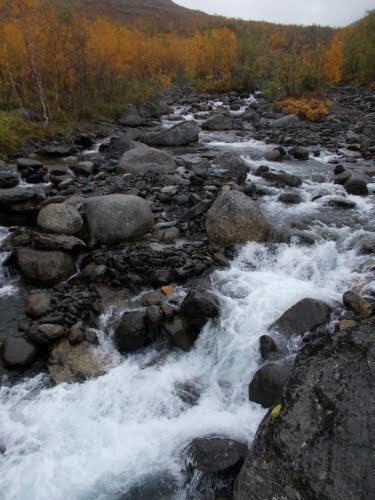 The hike to Abisko was rather uneventful. The rain stopped after about an hour and the fog started to lift. The sky was still overcast with only occasional sunrays getting through clouds. 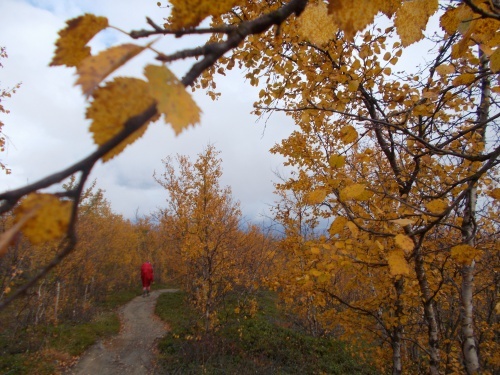 We were now at lower elevations, hiking among trees dressed in beautiful golden autumn colors. Helicopters were flying above our heads, transporting cargo between the mountains and town. 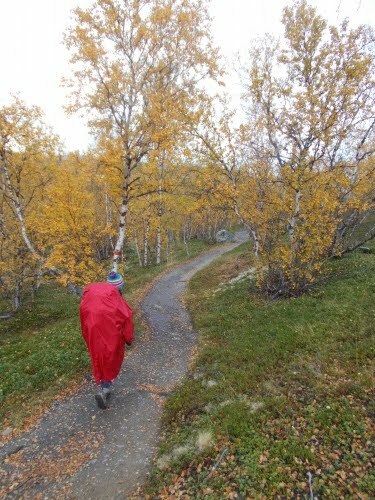 The closer we got to Abisko, the more people we started passing on the trail. Most of them looked like they were out just for half a day or so. They were carrying small day packs, their clothes and hair weren’t a mess and they smelled of soap. Ryan looked at some of those people and whispered to me “I bet they aren’t hiking to Hemavan!” Yes, we were definitely getting back into the so-called civilization! 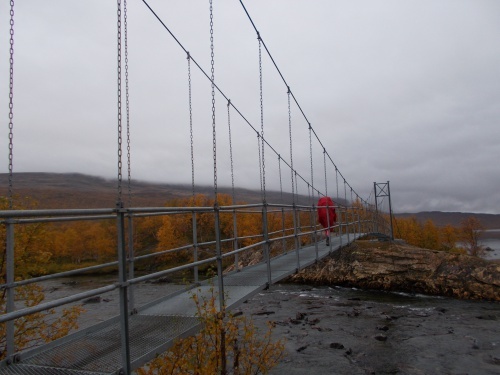 Eventually, we reached the gate that marked the end of the Kungsleden—or the beginning of it for those hiking from Abisko to Hemavan. It felt weird to me to be done—a mixture of joy and sadness. Joy because I was tired and looking forward to eating ‘normal’ food and escaping the rain and cold. Sadness because the great adventure was done. 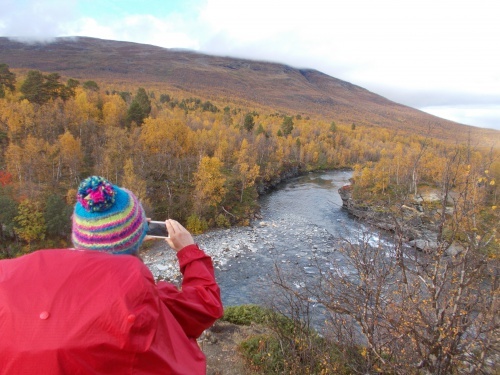 We took photos and videos at the norther terminus of the Kungsleden and headed towards the mountain station, Abisko Fjällstation, where we intended to spend the night. To get to the mountain station we needed to walk through a tunnel under a busy road. The moment I stepped into the tunnel, music started to play. I looked around and realized we were walking through a very interesting artistic installation. 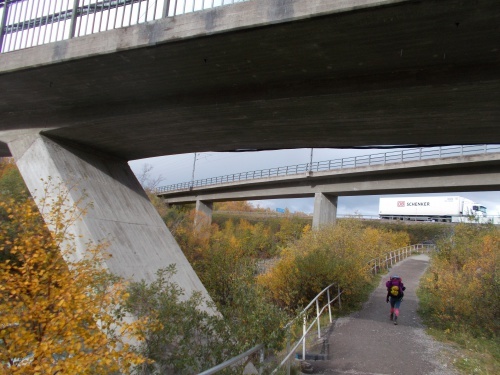 Walls of the tunnel were covered in paintings related to Lapland and the Sami culture. There were reindeer, there was snow, there were northern lights and the midnight sun. The tune that played seemed to be traditional Sami music. 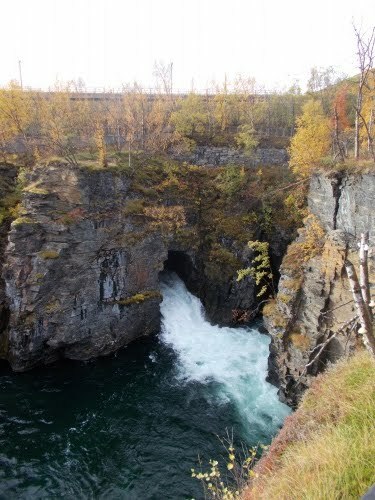 This is a video of the tunnel that Karolina describes. Photos can't get it all and don't capture the music at all--a video was definitely required here! 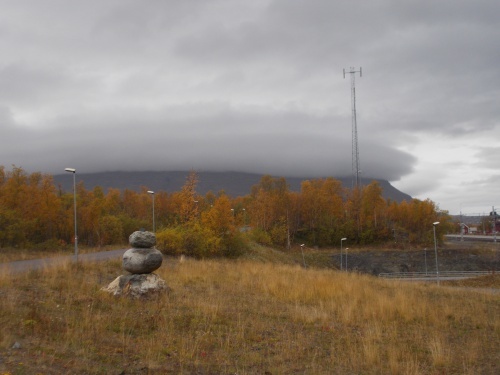 Before we reached the mountain station, we passed yet another artistic installation. 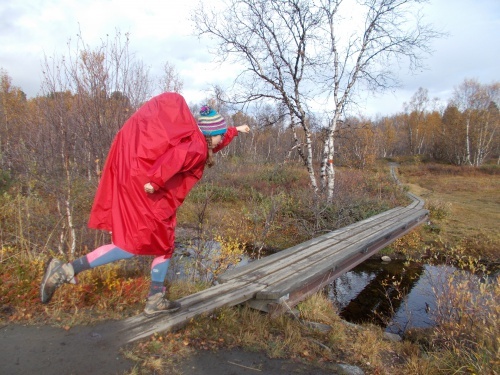 This time we walked between two walls made of wooden piles. 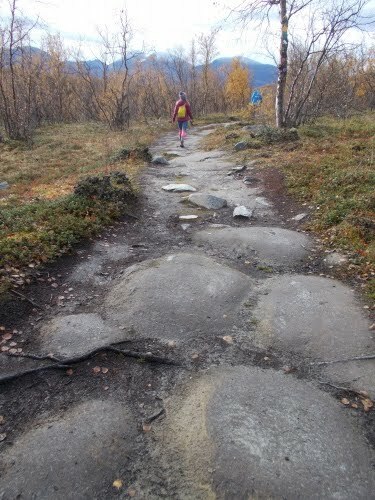 On one of the walls various landmarks along the Kungsleden were marked—lakes, mountains and mountain passes. 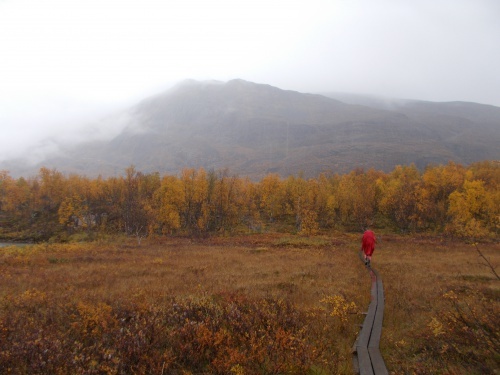 On the other wall, we could follow names of all mountain huts between Abisko and Hemavan. Walking through this installation felt as if we were re-hiking the trail in a fast-forward mode and re-living all the great adventures we had during our journey. 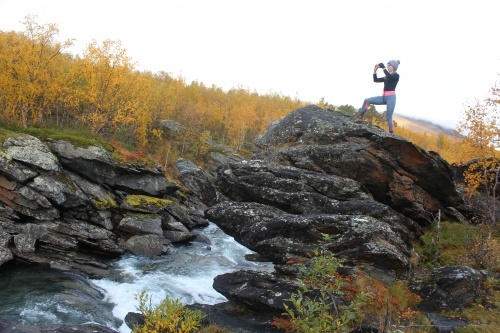 Karolina thru-hikes the entire Kungsleden Trail... again! In two minutes flat! At the mountain station, we got bunk beds in a 4-bed hostel room. We were the only people in our room, which we were happy about because it gave us some peace and privacy. 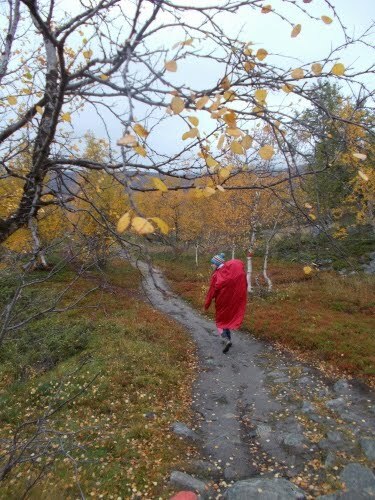 We ran the usual hiker-in-town errands: we took showers, did the laundry, ate and rested. Ryan picked up his mail drop that he had send from Ammarnäs. 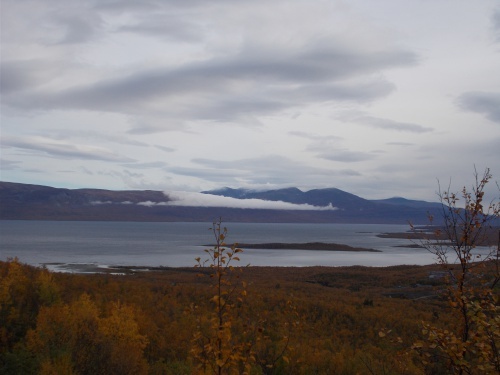 To our disappointment, we found out the nearest supermarket was located in Abisko-Östra—the village center 2 km away from the mountain station. 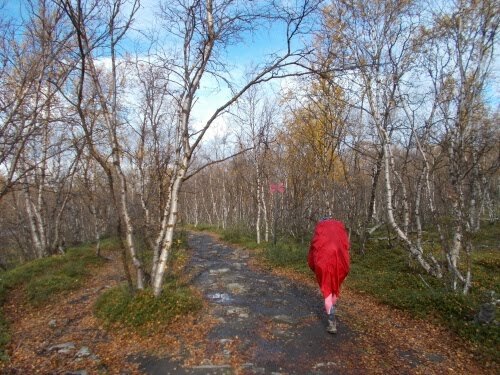 Neither of us felt like walking that extra distance after having just hiked almost 500 km (310 miles)! ;-) Fortunately, there was a small store at the mountain station and even though the supplies were limited and prices inflated, we decided to do our groceries there. For a moment, we considered the option of ordering dinner at the restaurant in the hotel part of the mountain station but after checking it out we decided it was too fancy and too expensive for us, so we ended up cooking dinner ourselves in the hostel kitchen. 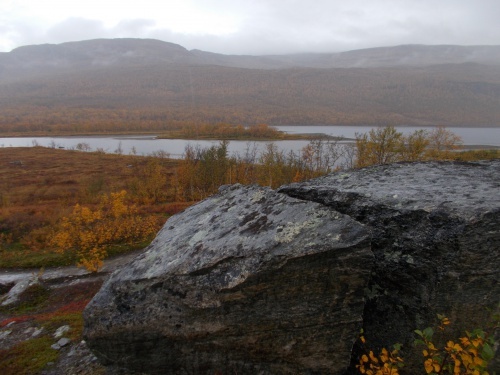 The kitchen was spacious, well-equipped and had a great view over the Torneträsk lake. After dinner, Ryan stayed in the kitchen, catching up with work on his laptop while I went to the sauna. When I returned, Ryan told me had had run into our Polish friends, Magda and Kamil. Apparently, at first, they didn’t recognize him—Ryan had shaved and now looked a good 15 years younger! Later in the evening, my Aurora Forecast app that I have on my smartphone sent me an alert saying that there was a high chance of seeing norther lights at my location right now. Ryan and I went out to check the sky and voilà! There it was—a giant aurora smudge running all the way across the sky right above our heads. We walked further away from the mountain station buildings in search for a spot where light pollution was smaller and we could see the norther lights better. We found a good place in a clearing between the buildings and the lake. A group of people were already gathered there, some of them clicking amazing photos with their fancy cameras on big tripods. We stood there for a while, watching the show above Torneträsk Lake. 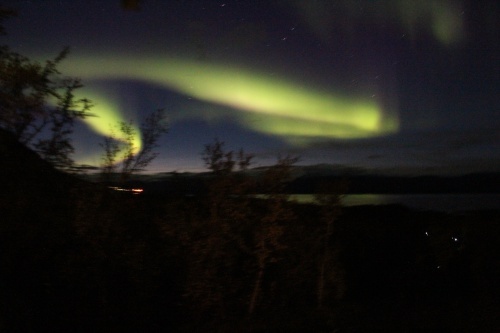 Northern lights were dancing, changing forms, appearing here and there. That was probably the longest and most extensive show we’d had seen so far! Finally, we got too cold. The temperature was low and most of our clothes were still drying after we did laundry, so we were rather underdressed for spending much time outside at night in the cold. Anyhow, it was already late and we needed to go to sleep. We wanted to get a good night’s sleep and wake up relatively early the next morning. 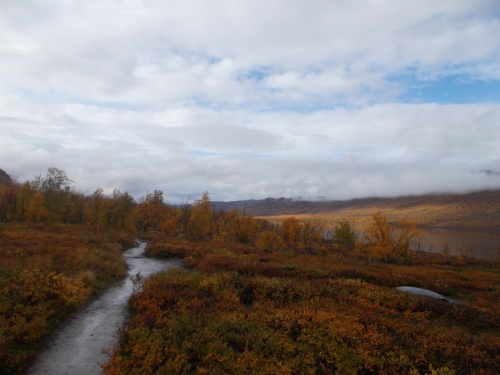 We might be done with the hike, but we still had two days before our flight left from Kiruna and tomorrow we planned for a day hike. 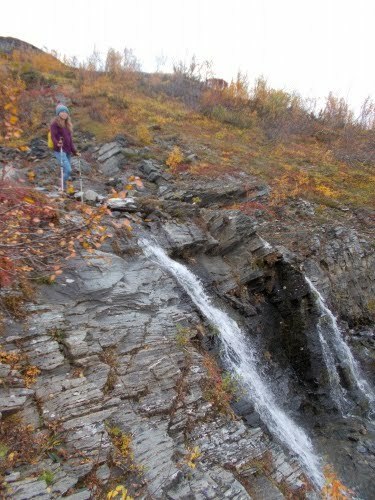 Just because we finished the trail didn't mean that there wasn't more to see! 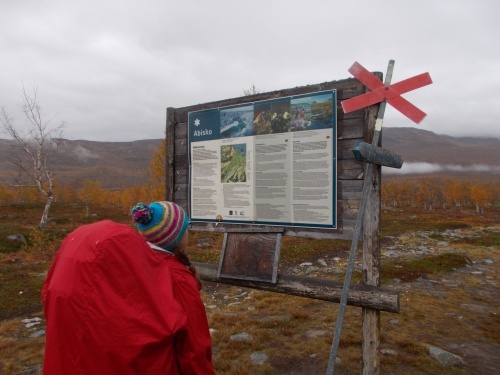 Karolina checks out the board marking the boundary into Abisko National Park. Karolina needs to tie her shoelace. *nodding* No tripping allowed! 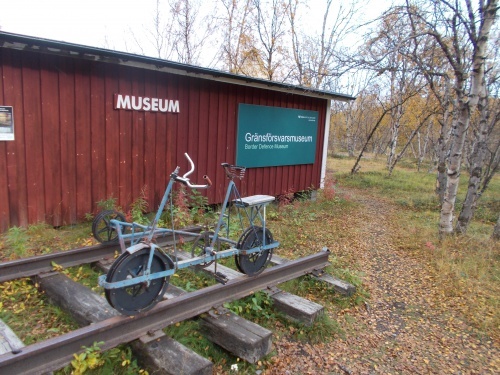 This is the border defense museum. 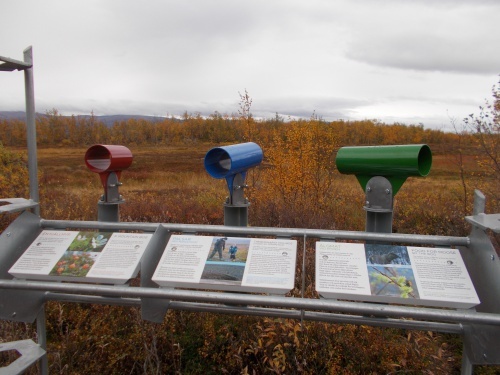 We're very close to the Norway border and troops had been stationed nearby--particularly during WWII when Norway was occupied by the Nazis. 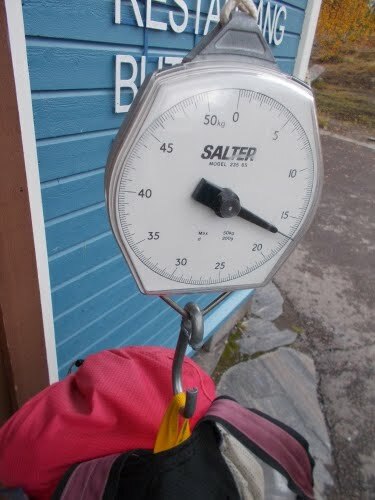 My final pack weight with almost no food or water came to 17 kilograms (37 pounds)--the lightest my pack had been the whole trip! 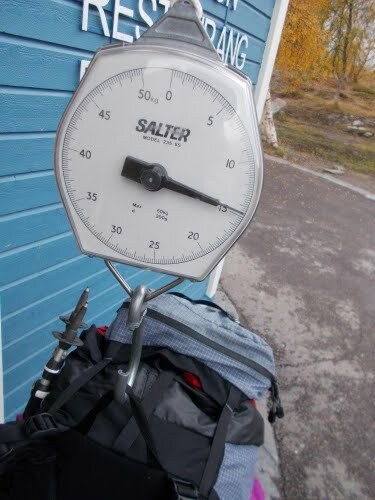 Karolina didn't carry a heavy, fancy camera or a laptop and her pack's final weight was 15 kg (33 pounds).